Read our NEW Consignor Guide to help you get started!!! ...and your check is ready two weeks later! You may choose to hep out for as many hours as you would like!! 4 hours will earn you 70% and with 8 hours or more, we will also waive your $10 consignor fee! Bring your items tagged, prepped, and sorted by type & size. Bring your signed Consignor Waiver, Car Seat Checklist, and Crib Checklist (if applicable). 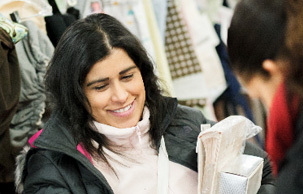 You will place your items on the sales floor (clothing & shoes will be inspected) - plan for 45 mins to an hour. Pick up your Presale Ticket & grab a Free Admission pass for your guest and get ready shop 'til you drop on Wednesday, March 13th! Click HERE to schedule an appointment for Sunday & Monday only. All items not picked up are donated. Car seats, and car seat bases cannot be older than 5 years old (5 years and 0 months). There are a few excecption-check manuafacure info for expiration year. All car seats, car seat bases, and infant carriers that function as a car seat with a stroller combo will be inspected after drop off. Please click HERE to download our Car Seat Checklist that must be submitted for each car seat/base, and booster seat that will be consigned. Note: You MUST attach completed car seat waiver to the car seat,base, and booster. Note: Place carseat waiver and instruction booklet into Ziploc bag and safety pin to car seat. Shoes – All sizes accepted; must be appropriate for children; near perfect condition; CLEAN. Newborn thru Junior Sized clothing. Child size PLASTIC hangers are required for 3T and under. Only PLASTIC hangers are accepted. When hanging pants, attach safety pins to the TOP part of the hanger to ensure that pant will not slide. We attempt to remove hangers from the hung clothing items that are sold. These hangers will be available to consignors on a first come first serve basis during pickup. Hangers can be found inexpensively at most discount stores such as Wal-Mart, Target, the Dollar Stores, and thrift stores. Several department stores will give you leftover hangers...call them toward the evening hours (Old Navy, Carters Fred Meyer, Shopko, Children's Place, etc). Note: Sets sell well, so match things up if you can. Make sure that the sizes are the same. Note: As kids reach the pre-teen sizes (14-20), they are very particular. Clothing must be in excellent condition and very CURRENT style. Click HERE for a lisitng of ACCEPTABLE ITEMS for our upcoming Event. 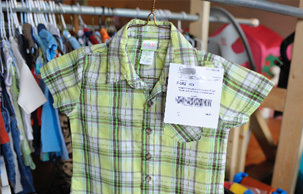 Despite our best efforts during inspection at consignor drop off, occasionally unacceptable JBF items such as stained, incomplete, defective or recalled items are over looked. These items will continue to be immediately removed from the sales floor and tracked (see Perfect Inspection Policy). Consignors may claim these items in the designated area at consignor pick up. This process will help make us aware of those consignors who are not following JBF guidelines. To avoid loss of consignor privileges, please take the necessary time to carefully inspect all of your items BEFORE consignor drop off. VALET CONSIGNOR SPOTS ARE FULL FOR OUR SPRING EVENT! if you are still interested in having JBF tag your items, we might be able to have you participate in our Olympia event! Email at Seattle@jbfsale.com for more info.